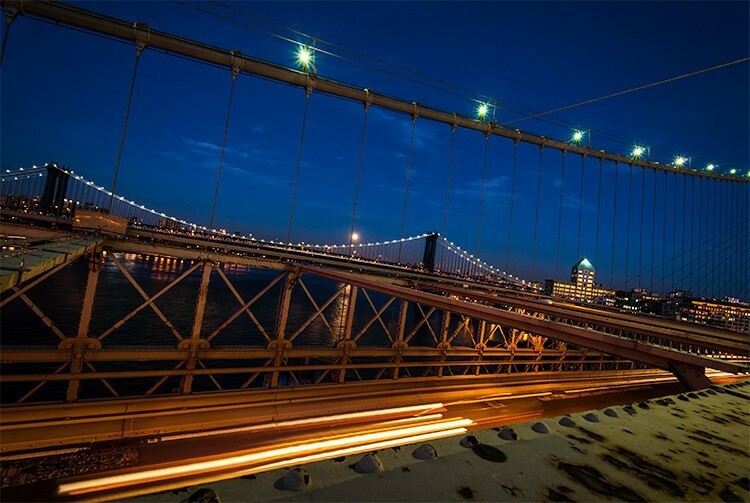 Night photography is something you can enjoy doing anywhere, even in your own city. 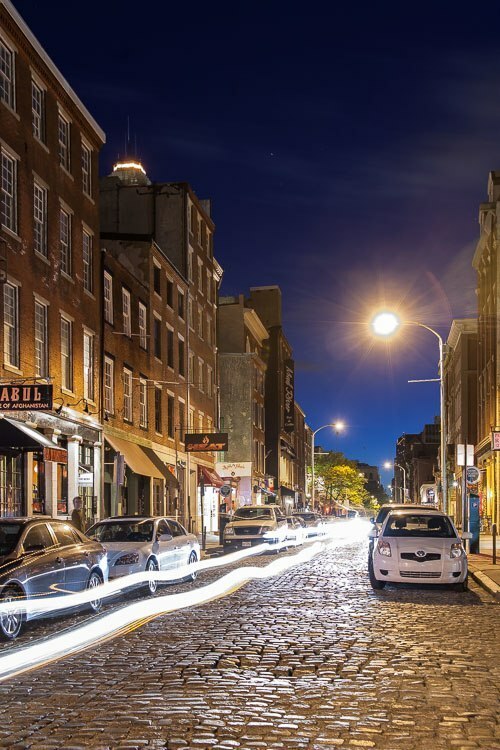 If you do live in an urban area, one aspect of night photography you can experiment with, and create some stunning images, is photographing light trails from car headlights using long exposures. I'm going to show you how to do just that in this tutorial. Okay a lens might be handy also, as well as a flashlight or headlamp, so you can see what you're doing in the dark. But other than these few things, that's all you need. 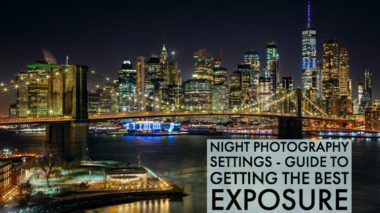 I go into more detail on equipment for night photography in this article: Three Special Effects for Night Photography if you want more information. 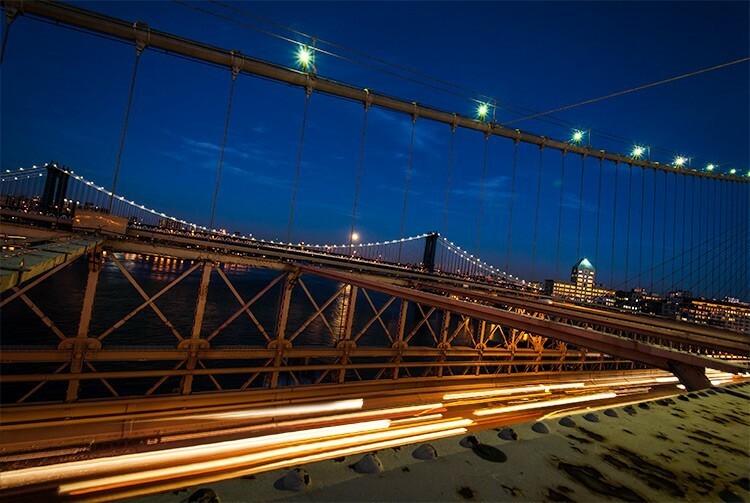 Light trails work best when you have a higher vantage point than straight on to the roadway. So look for a location ahead of time. Drive around and look for options and ways to get yourself and your camera up higher. Bridges work well, a high-rise rooftop, or even head to the top of a parkade (a car park for those of you in the down under part of the world). If you're travelling request a room on an upper floor if possible. 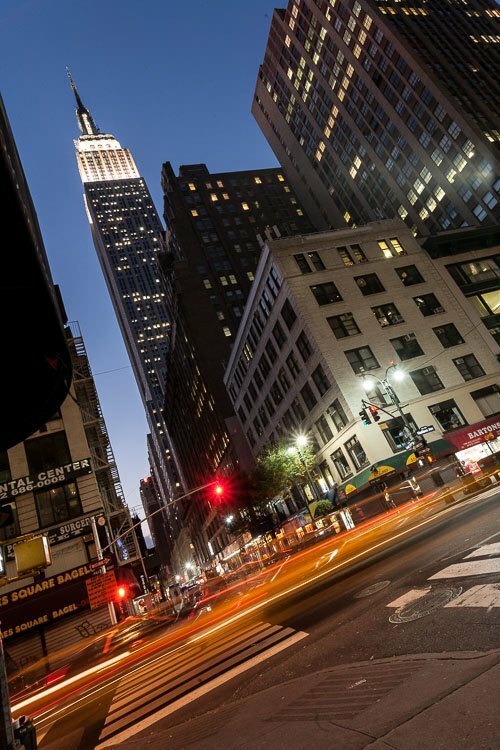 Find out if there are any tower or tall buildings with viewing or observation decks and head there. Light Trails – Mebourne, Australia – ISO 200 at f/5.6 for 15 seconds with a 17mm lens. 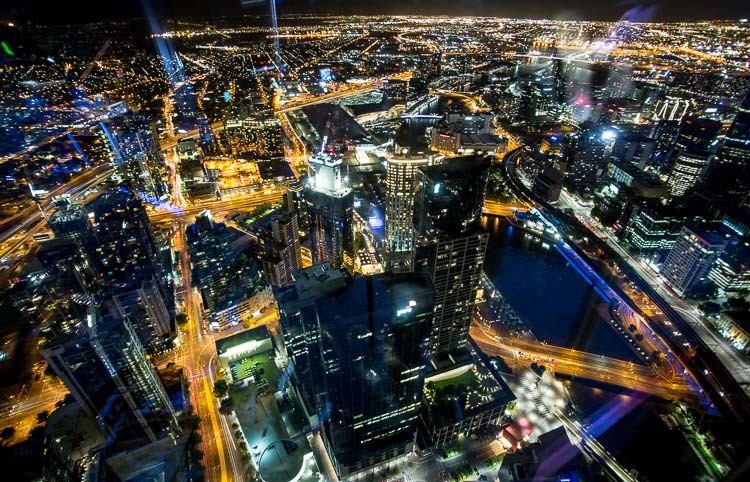 The image of light trails above was taken from the Eureka Tower Skydeck 88 in Melbourne, Australia. I timed my visit to get there right before sunset so I was able to capture some of the city first, and then the twilight hour, as the lights all came on and the city really started to twinkle. Make note: if you are going to do this type of shot – bring your polarizer! You'll notice there are a few reflections from the glass as this was taken from inside and I did not have a polarizing filter with me – learn from my mistakes. I had to use my jacket to try and cover up the tripod legs which were really reflective, and find the best angle to minimize the amount of reflections. This step has three parts. Part one is getting there at the right time. If you want to still have colour in the sky you'll want to arrive at Blue Hour. That is the time just after sunset when the sky is a deep, rich blue. It will help to provide separation between the sky and buildings so you don't end up with a big blog of blackness where you can't tell where the city ends and the why begins. Perhaps a future article on Blue Hour is in order! The second part of timing it right has to do with the actual exposure time. 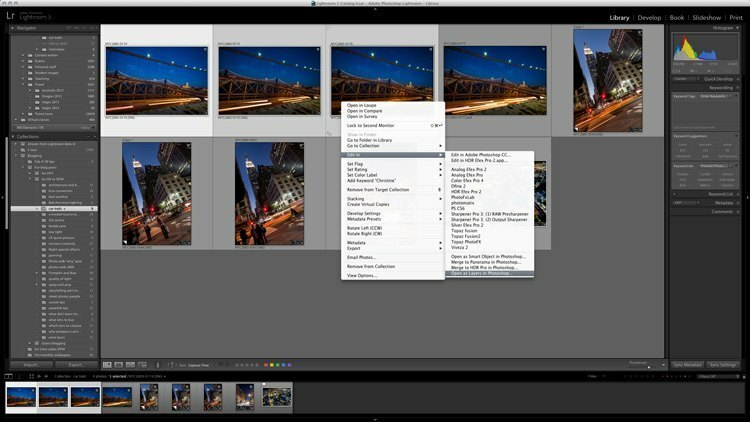 You want to figure out your camera settings to make sure you have a well exposed image. But, you also need to determine how long to make the shutter speed and if you want lights that are blobs or ones that are starbursts. Scroll up and look at the image at the top of the article again. Study the bright street light. What do you notice? It's got some starburst arms starting, but mostly it's a blob. Now compare that to the image below and notice at the red stop light in particular. 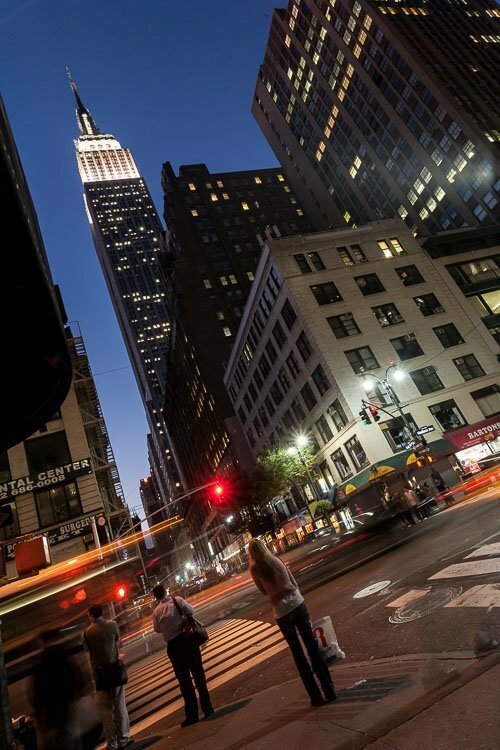 NYC the Big Apple – ISO 500 at f/13 for 1.6 seconds with a 21mm lens. Voila starburst achieved! The difference between the two shots is the aperture. 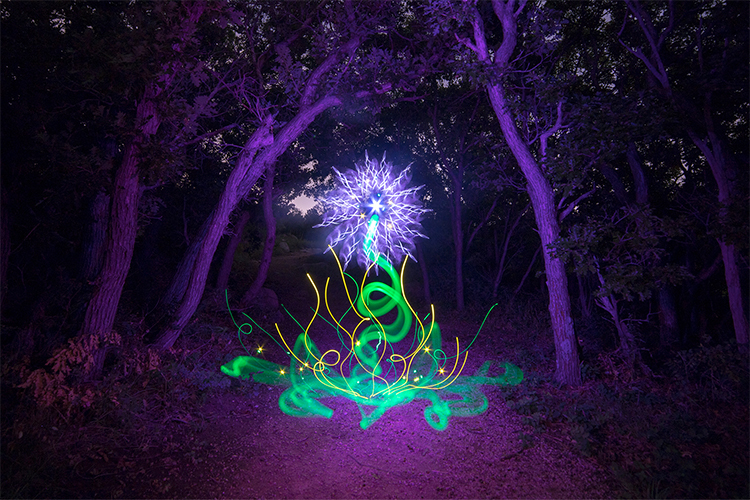 The smaller you make the aperture, the more of a starburst effect you'll get on bright light sources. Usually around f/8 is where they'll start to get the starry look, and you'll notice I was at f/5.6 in the top image, and f/13 here. Aha! The last part is the length of the exposure, and when to press the button. In photography timing can be everything and can make the difference between “meh”, and “WOW” in your images. Sometimes a fraction of a second, literally, can make or break the shot. So part of timing is playing with shutter speed times to get the look you want, while still maintaining the stars you just made with the tip above. Increasing the ISO to 500 allowed me to shoot at f/11 to get the starburst effects, and still keep my exposure times a bit shorter, so I could squeeze off a few more shots in the remaining minutes of light. ISO 125 would have given me an exposure time of 6.4 seconds, so literally I got four times more shots in the same period. The other balance is I was trying to time it with the traffic light going across the shot (left and right) and not the other direction. I also wanted the people standing on the corner to be relatively sharp, and at 6.4 seconds they would likely just be a blur. The other thing about timing shots like this is having patience. Wait for just the right car or person to enter your scene, and press the button at just the right time. This is the shot I was waiting for below. 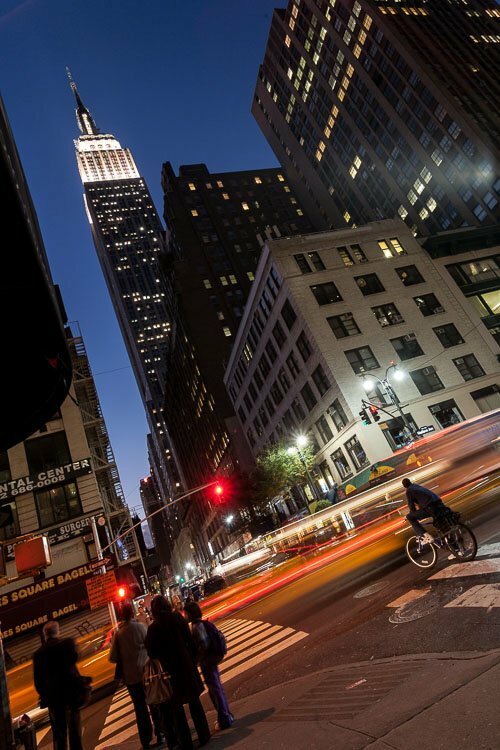 The cyclist stopped, and a yellow taxi flowed through the intersection – click and done! This step is optional as it's a bit more advanced. To do this you need to use a photo editing software like Photoshop, Elements or even GIMP, that works with layers, blend modes, and masking. If you don't have such a program you can also try StarStax. It's a free program that's usually for stacking images shot for star trails, but the principal is the same. It just doesn't give you options like masking if you need to hide something. What you basically do it plant your camera and tripod and do not move it until you've taken several different shots. Make sure the exposures are all the same (this is why you want to shoot in Manual mode) and just press the shutter release to capture cars at different times and locations in your scene. Let's look at single image, then add the extra shots and layers, so you can see how this works. 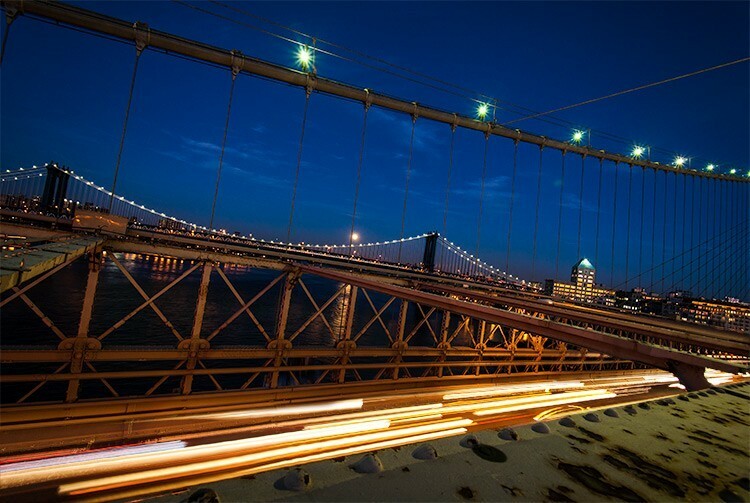 Light Trails – Brooklyn Bridge NYC – ISO 200 at f/9.0 for 2 seconds with a 17mm lens. Not bad, right? I got a few light trails and still have a nice deep blue sky. I could have changed my aperture to f/16 or f/22 and just exposed for longer but I found the traffic was coming in short spurts, and I didn't want to stand there for a 16+ second exposure. Plus the part of the bridge I was standing on had traffic going by also, so I was trying to time it to get the traffic below and not behind me (it was shaking the bridge and my tripod). So there are a lot of factors to think about when choosing your exposure. The best thing to do is set up, take a few shots and play! Finally let's add one more shot. You can do this with as many images and layers as you like. I'm just going three here for ease of demonstration. Notice how there now appears to be more cars and light trails as each image is adding on the previous one, only in the light areas. This also works well if your camera can't do really long exposures. Do what you can and add them together. Just remember the key here is keeping everything registered so there's no funny misalignment issues in the combined version. Are you ready to go try this? Let me know if you have any questions about this technique and please share your images and results in the comments below.